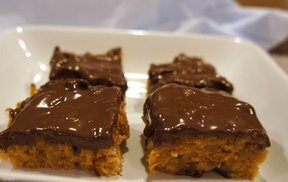 With the perfect combination of peanut butter and chocolate, these sweet crispy treats are easy to make and are sure to be a hit. You won't believe how fast they disappear! Grease the baking pan with margarine and set aside. Combine the sugar, corn syrup and margarine in a large saucepan. Measure out the peanut butter and set aside. Heat sugar, syrup and margarine over medium high heat just until it comes to a rolling boil. Remove from heat and add the peanut butter in the saucepan. Stir until the peanut butter is melted and mixed in evenly. Add the cereal and stir quickly, making sure all cereal is coated evenly. 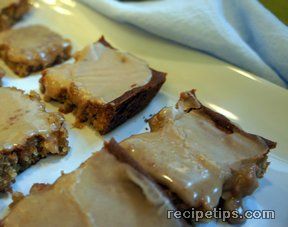 Pour mixture into the baking pan and quickly press down with greased hands to distribute evenly. 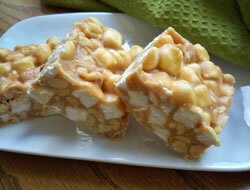 Immediately distribute the chocolate chips, peanut butter chips and butterscotch chips over the top of the warm bars. Allow chips to sit for 10 minutes. Check with a knife to see if they have all melted. Spread evenly over the top of the bars. If chips are not completely melted allow them to set for another 5 minutes and then finish spreading. 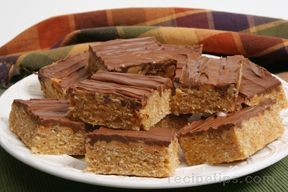 Allow to cool at room temperature and then cut into bars.